Even the most ardent Wellington Dukes fans had to wonder what their favourite team had gotten themselves into after blowing a 3-1 series lead and being forced to win a second connsecutive Game 7 on the road in order to move on to the championship round of the 2019 Buckland Cup playoffs. Sure the Dukes have been road warriors this post season, having picked up seven wins away from Lehigh Arena but couldn’t this wind up being a case of going to the well one too many times? Even a dyed-in-the-wool Dukes fan lurking about Lehigh sort of shook their head when the Gazette inquired about the team’s chances on Sunday morning as the club was making their way to the Herb Carnegie Arena for a contest that would decide the Ontario Junior Hockey League’s Southeastern Conference Championship and set up a Buckland Cup finals date with the awaiting Oakville Blades. Of course a great Wellington fans packed a bus and flocked to the Herb to see their club either walk a tight rope into an opportunity to defend their 2018 Buckland Cup title or fall trying to the North York Rangers, a team that came back on Wellington to force Sunday’s ultimate affair. Those fans wouldn’t leave the rink disappointed and the Dukes-the Wellington Dukes, Game 7 warriors and crushers of dreams- captured a second straight conference championship and punched their ticket back to the Buckland Cup finals on the strength of a 5-3 win. It would be a gritty, gutsy effort by a team that’s been feasting on such fare, having played their fourth Game 7 over the past two post seasons on Sunday and bringing ultimate joy to local hockey fans in the process. Wellington Dukes Head Coach John Druce said there was a sense of confidence in the dressing room on Sunday Wellington could build on their Game 7 legacy but it wasn’t without a sense of urgency. The Dukes would end the first period down 2-1 as goals from Dante Spagnuolo and Cole Ohara sandwiched a tally by Dukes forward Dawson Ellis. But as has been the trade mark for the locals through the previous two post seasons under Wellington Head Coach John Druce, a second frame when the stakes are at the limit seems to be where the Dukes start to impose their will on opposing teams. In the second, the ice was tilted in Wellington’s favour as the Dukes would put 16 shots at Prince Edward County native Jett Alexander in the North York net. After immense pressure and a disallowed goal by Ellis, Wellington got the game back to square when Andrew Rinaldi picked up his second assist of the game, feeding Elijah Gonsalves who backhanded his tenth goal of the post season. Tied 2-2, Wellington continued to press and wound up getting a powerplay opportunity later in the frame. Just under a minute into the man advantage, Brett Humberstone and Ben Woodhouse would set up Dan Panetta to put Wellington ahead for the first time in the game with 3:09 left in the second period. The game track in Game 7 took on a similar path to that of Game 6 only with Wellington taking charge down the stretch. Up 3-2 into the final five minutes but knowing there was still a massive push to come from the Rangers, Rinaldi would charge in on Alexander and beat the net minder clean upstairs with just under five minutes remaining to score his OJHL post season leading 11th goal, pushing Wellington ahead by a pair. However the Rangers, nationally ranked in the Canadian Junior Hockey League all season and South Division regular season and playoff champions, refused to go quietly. Rangers bench boss Geoff Schomogyi would lift Alexander early and the gambit paid off as Jonathon Hampton was left all alone as an extra attacker and swept a puck past Logan Bateman with just under three minutes left in regulation to get the hosts within a goal. But Wellington buckled down and kept the puck to the boards as best they could and held the blueline, forcing the Rangers to recoil a number of times. Finally, after a loose puck came to the stick of Ellis with just under 90 seconds left, the Campbellford native figured ‘Why not?’ and dialed long distance from the 416 area code, sending the disc 118 feet into the yawning North York net. 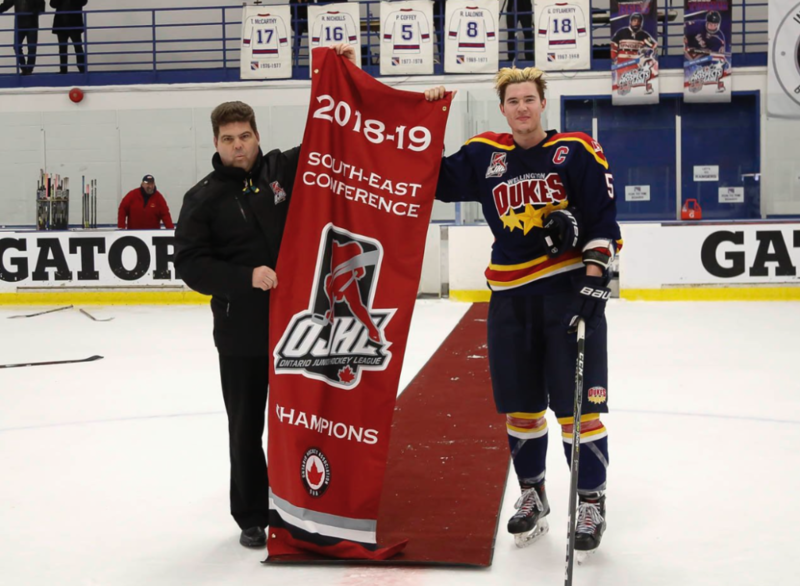 Maple syrup cans filled with pennies shaken by over half of the 500 people in attendance provided the sound track to the final moments of a second consecutive OJHL Conference Championship for Wellington as the Dukes faithful cheered and applauded the dying moments of Game 7. After the contest, Rinaldi, already a Wellington Dukes legend and adding to his unforgettable legacy every daily, penned a special note on the club’s social media page after the contest, thanking the fans for their enduring support throughout the playoffs. Bruce said Rinaldi has elevated his game this post season and is playing more mature and confident game. Game 7 was forced after the Dukes dropped Games 5 and 6 in opposite ways. 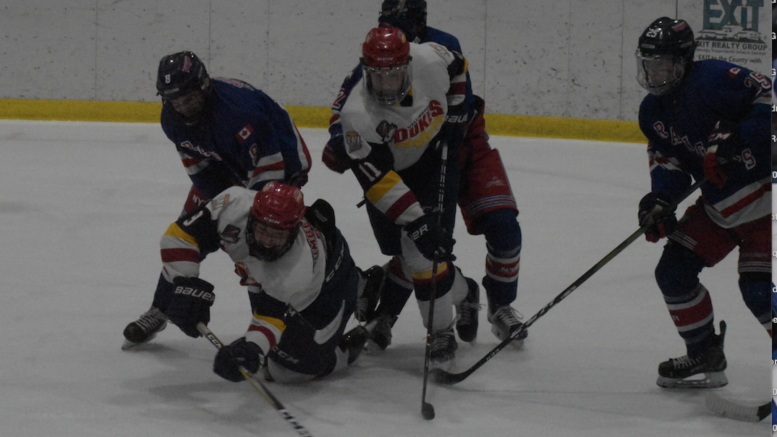 With Wellington up 3-1 in the series and having blown out the visitors at Lehigh Arena 7-2 in Game 4, the Dukes had to know there was going to be a huge push back by the Rangers in Game 5 and that’s precisely what transpired when the teams hit the ice Thursday in North York. The contest wasn’t even 20 minutes old and the Rangers had chased Bateman with a handful of goals over the opening 16:50. Wellington’s Woodhouse would snipe a powerplay marker in the second in what was the frame’s only goal to make it 5-1 in favour of the hosts but that was as close as Wellington got to the South divison champs in Game 5. In the third, Ranger forward Ross Kreiger solved Wellington back up Kyle Renaud at the 2:44 mark to make it 6-1. Quinn Hanna’s blast would get Wellington to within four goals once again at 5:36 but a pair of Rangers tallies would effectively dismantle the Dukes on Thursday night and make the final 8-2. A mix up with just over five minutes left led to Zach Uens incurring a gross misconduct for helmet removal and the rangy blue liner was lost to club for Game 6 with a one game suspension. Unlike the previous two decisive contests, Game 6 on Friday evening could have went either way. After a scoreless first, Wellington would open the scoring in the second stanza when Rinaldi came flying down the wing and beat Alexander to the glove side high at the 5:08 mark, sending the home side fans into a frenzy. But of the 1,069 souls in attendance, there was more than a handful of Rangers supporters including a number of County residents who were backing their favourite OJHL goaltender in Alexander. 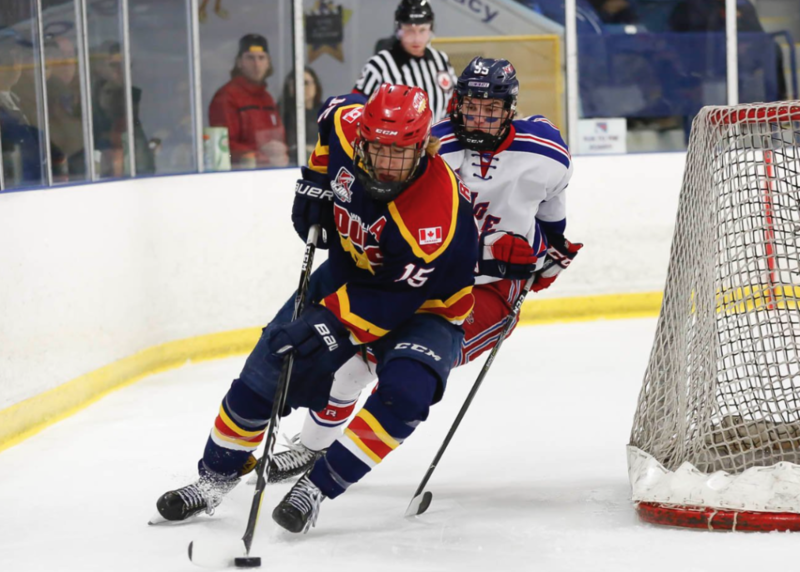 When Tyler Flack countered for North York off a juicy rebound in the slot, the Rangers fans made themselves known and heard. One of the most controversial moments in the series came in the dying moments of the second while Wellington was working a powerplay. Gonsalves made a drop pass to a vacant blueline with under a minute left that Hampton picked up at mid ice. Thankfully for Wellington, Hampton fell down on a break away just outside of the blue line and the potential shorthanded goal in the final minute of the period was averted. But referee Sean Coles must have believed Hanna used mental telepathy to make Hampton fall and whistled the Dukes defenceman for tripping, drawing the ire of more the 900 leather lunged Dukes fans. A video highlight package produced by Your TV in Belleville definitively shows that no Wellington Duke was within five feet of Hampton when he stumbled. The game would remain tied through the opening ten minutes of the third and Alexander needed to be sharp to keep Wellington from pulling ahead. Rinaldi had at least one chance in close that could have pushed the hosts into a clinching position. But a brutal turnover in the Wellington zone as the team started to tire was the spark the Rangers needed. Collecting the puck off the boards, Krieger skated to the high slot and took a shot that Bateman got a glove on but couldn’t control. The biscuit would tumble end-over-end and eventually crossed the line to put the Rangers ahead 2-1. But the Dukes did have a response to Krieger’s second into two games as Wellington controlled an offensive zone faceoff and eventually Gonsalves would deliver the puck to Hanna who snapped a shot past Alexander from the blue line with 4:56 remaining. But the Dukes were tired and the game winning tally with 91 seconds left was indicative of that fact. Off a defensive zone faceoff that was a result of an icing call, a fresh Aidan Casey was able to dance to the slot and pick up a rebound off the stick of Bateman who was unable to sweep the puck to the corner. Casey’s back hander with 1:31 to go was the winner and Hampton would bang home an empty netter with a second left to make it a 4-2 final in favour of the Rangers, setting up Wellington’s gutsy Game 7 effort and their second winner-take-all showdown on the road this post season. Ledes at Lehigh: Wellington will open the Buckland Cup Finals on the road, making it the fourth straight series in the 2019 post season where the club has been tasked with a Game 1 date away from Lehigh Arena…The Blades have needed five games to get past their three prior opponents (Brampton, Buffalo and St. Mikes) and are ranked third in the country…Druce expects the Blades will bring much of the same type of game North York brought to the table and the Finals opponent plays a high speed game. “There’s not a lot of weaknesses in that line up and the Olympic sized ice they play on will will make for a chess match.”…Wellington defeated Oakville in the 2011 Buckland Cup finals under the direction of former head coach Marty Abrams…Oakville denied Wellington a date with the Kingston Voyageurs in the 2009 Buckland Cup Finals, blanking the Dukes 3-0 in Game 7 of the conference finals…Wellington has been getting some solid milage out of Picton Pirates callup Landon McLellan. The Belleville native who turned 18 in February had 46 points in 43 games for Picton this season and was a valuable contributor at both ends of the ice for the Pirates. Druce has used the rookie in three post season games thus far and hasn’t spared the forward in any high leverage situations in the third period, often paring the 6’2”, 190 lbs er with Dan Panetta. “I’ve been impressed, he’s been doing the right things at the right times for us and I like what he brings and we value the extra body when we need to replace someone in the line up.”…Druce added that Ellis’s play has been exceptional down the stretch and has been providing valued leadership both in the dressing room and on the ice.